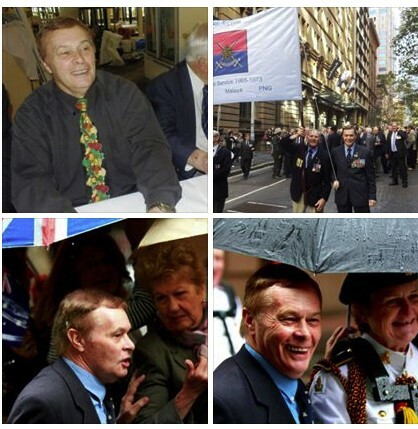 We had some great times together since 2007 when Colin and Judy attended a PCFA Men’s Health Forum in Darling Harbour. I was always in awe at his love for Judy and admired his email updates leading up to her passing on 9th March 2009. When in Thredbo we always visited Judy’s plaque hidden between granite boulders at the top “The Cruiser “ chairlift above Merritts Mountain House. Colin maintained the family passion for skiing by taking Lisa every year to Thredbo. Lisa is a gutsy skier even after damaging a knee in a fall in 2010. Colin focussed on Lisa’s needs over the past 6 years whilst maintaining a heavy schedule with Sydney Markets. Lisa is almost on the verge of gaining her “Ps” and she might have her eye on another smart BMW (Colin’s pride and joy). Colin graduated as a Second Lieutenant at the Officer Training Unit, Scheyville in Class 1/72 and was posted to Infantry Corps. In a career spanning 21 years he served in command, training and operational appointments in Australia, Europe, South-East Asia and with UNTSO in the Middle East. He rose to the rank of Lieutenant Colonel and served as SO1 Organisation, Land Headquarters, before retiring from full time military service in 1993. He continued to serve in the Army Reserve with Land Headquarters until 1997. As well as being a graduate of the Australian Army’s Command and Staff College, he was a Certified Practising Accountant (CPA), Associate Fellow of the Australian Institute of Management and Australian Institute of Training and Development. Through the Sydney Market Foundation Colin chaired many committee meetings and officiated or was MC at numerous events and functions; he was a consummate performer with Military precision ably assisted by Carol Dollar. Mango (Fundraiser for Prostate Cancer Foundation of Australia) and Cherry Auctions at Sydney Markets raising close to $80,000 for PCFA over the last 5 years. Sydney Market Foundation functions at Rosehill races & Gala evenings where I got to meet his brother Les, daughter Melani and son Zion, Colin was a proud grandfather to Melani’s children. ANZUP “Below the Belt” Pedalthon at Sydney Motorsport Park, Eastern Creek. Colin and the Mango Auction team were honoured by PCFA at Kirribilli House & NSW Government House over many years in recognition of funds generated for prostate cancer research. My thoughts and prayers have been with Colin during his extended ordeal at Macquarie University and Greenwich Hospitals. OTU members at the 50th Anniversary of National Service Commemoration in Canberra offered their condolences last Tuesday. May Colin now “Rest in Peace” without pain or suffering ! !